Henrietta Mears - This shortest of all Paul’s letters was addressed to Philemon (although two other persons are included in the salutation). Paul entreats Philemon, the master of Onesimus, a runaway slave, to receive him back as a brother in Christ (see Philemon 16–17). This very personal letter reveals not only the concern of the apostle for a converted slave but also a practical demonstration of brotherhood in Christ, where “there is neither bond nor free” (Galatians 3:28). Christian love and forgiveness are given prominence in the book of Philemon. The power of the gospel in winning a runaway thief and slave and in changing a master’s mind is clearly shown here. This is a book in applied Christianity, a textbook of social service. The Reverend Sir W. Robertson Nicoll, editor of the Expositor’s Bible, once said, “If I were to covet any honor of authorship, it would be this: That some letters of mine might be found in the desks of my friends when their life struggle is ended.” We don’t know whether Paul coveted this honor or not, but tucked away in your New Testament, between Titus and Hebrews, you will find a model letter written by a master of letter writing. It is a personal letter from Paul to Philemon. Only one chapter—only 25 verses—but containing such strong and beautiful statements so well expressed that it stands out as a gem, even in the Book of books. Notice the courtesy and tactfulness of Paul’s letter. Letter writing seems to be a lost art these days, having given way to emails and text messages, but text of any sort can be a ministry for God, if we make it so. Some people who find it hard to speak to anyone about Christ might easily write about Him. Then, too, text is good for the one who receives it, for the person has a chance to read and reread it and think its contents over. Use the keyboard (or that old-fashioned pen) to witness to your friends. Remember that all that has been preserved to us of Paul’s ministry has come mainly through his epistles—letters, even short ones. What a heritage his letters are for all Christians today! In order to appreciate what God thought of correspondence, see how many letters He kept for us in Holy Scripture. In this letter, Paul intercedes with Philemon (who was an outstanding member of the church at Colosse) for his runaway slave Onesimus who had stolen from his master and made his way to Rome. There he had been providentially brought face to face with Paul and had found Christ as his Savior. He became endeared to the apostle by his devoted service. But Paul knew he was Philemon’s lawful slave, so he could not think of keeping him permanently. So Paul sends him home and pleads with Philemon to take him back. He makes himself personally responsible for the debts that Onesimus owes, asking that they be charged to his (Paul’s) account. He wished to save the runaway slave from the severe and cruel punishment he deserved according to Roman law. Paul sent his letter with the slave so that Onesimus would not encounter his outraged master alone. J Sidlow Baxter (Explore the Bible) - Even in the best art galleries there is always a space for choice miniatures. This personal note from Paul to Philemon is such a graceful little masterpiece of "fine courtesy, exquisite tact, and even playfulness of wit," and withal it has such distinct spiritual values, that one can only wonder sadly at those who have begrudged it the little niche which it adorns. As G.G. Findlay says: "In every line and syllable this note betrays Paul's personality. Nothing more genuine was ever written." Does it seem almost unworthy of mention that from the fourth century, when it was questioned as being supposedly beneath the dignity of apostolic authorship, there have been those who have doubted it? We need not linger over these. The late scholarly Dean Alford's comment will suffice: "It (the letter) was preserved in the family to which it was addressed, and read first, no doubt, as a precious apostolic message of love and blessing, in the church which assembled in Philemon's house. Then copies of it became multiplied, and from Colosse it spread through the church universal. It is quoted as early as the second century, and has ever, except with some few who question everything, remained an undoubted portion of the, writings of St. Paul." We may well be grateful for its preservation to us. Though so short, this note to Philemon has points of unique interest. 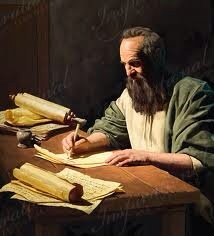 When one reflects, Paul must have written numerous short letters, besides his "epistles." This is the only private letter which has survived to us. It attempts no grandiloquent phraseology, but it is a perfect model of "tact, delicacy, and good feeling" connection with a sensitive, master-versus-slave situation. It is a revealing little window into the more private contacts and disposition of the apostle. It provides a unique practical illustration of Christian principle applied to social relationship. It says by example what Galatians and Colossians say in precept, as to the "nullity of worldly rank" in the Church, i.e. "There is neither slave nor freeman in Christ Jesus." One only needs to know the helpless abjection of slaves under Roman law to realize the height which Paul scales when he asks the slave-owner to receive back the runaway thief-slave as a "brother beloved" (Philemon 1:16). The Letter - But what shall Paul say to a master who has been so outraged? Terrible punishments were sanctioned by Roman law for such offences, even to the inflicting of death. Bishop Lightfoot comments: "The slave was absolutely at his master's disposal for the smallest offence he might be scourged, mutilated, crucified, thrown to the wild beasts." But Philemon was himself a Christian brother, which fact put a kindlier complexion on the situation and gave Paul his basis of appeal. So the little letter was composed and sent on its delicate errand. And what a little masterpiece of guileless diplomacy it is! Read the following eulogy from Smith's Bible Dictionary s.v..
"The Epistle to Philemon... has been admired deservedly as a model of delicacy and skill in the department of composition to which it belongs. The writer had peculiar difficulties to overcome. He was the common friend of the parties at variance. He must conciliate a man who supposed that he had good reason to be offended. He must commend the offender, and yet neither deny nor aggravate the imputed fault. He must assert the new ideas of Christian equality in the face of a system which hardly recognised the humanity of the enslaved. He could have placed the question on the ground of his own personal rights, and yet must waive them in order to secure an act of spontaneous kindness. His success must be a triumph of love, and nothing be demanded for the sake of the justice which could have claimed everything. He limits his request to a forgiveness of the alleged wrong, and a restoration to favour and the enjoyment of future sympathy and affection, and yet would so guard his words as to leave scope for all the generosity which benevolence might prompt towards one whose condition admitted of so much alleviation. These are contrarieties not easy to harmonise; but Paul, it is confessed, has shown a degree of self-denial and a tact in dealing with them, which in being equal to the occasion could hardly be greater." Free from the Law; oh, happy condition! Jesus hath bled, and there is remission! Grace hath redeemed us - once for all! Fellow (4x) - fellow worker (Philemon 1), fellow soldier (Philemon 2), fellow prisoner (Philemon 23), fellow workers (Philemon 24). Fellow workers (4904) sunergos (Observe Demas - Phile 1:24 ~60-61A.D; Col 4:14+ ~60-61 (probably same imprisonment as Philemon); 2 Ti 4:10+ ~67A.D. Philemon: A Brother Restored - Ray Stedman - "The Bible without the Spirit leads to a dead, institutional Christianity. The Spirit without the Bible leads to groundless fanaticism. We need both the Spirit and the Word to effectively Adventure through the Bible." What's the big idea? - Paul’s message to Philemon was a simple one: based on the work of love and forgiveness that had been wrought in Philemon’s heart by God, show the same to the escaped and now-believing slave Onesimus. The apostle’s message would have had extra force behind it because he knew Philemon personally. Paul had explained the gospel to Philemon and had witnessed the profound result: new life blossoming in a once-dead heart (Philemon 1:19). Paul knew that conversion is nothing to trifle with, but that it should be honored and fostered. So Paul made a request. He wanted Philemon to forgive Onesimus, to accept the slave as a brother in Christ, and to consider sending Onesimus back to Paul, as the apostle found him useful in God’s service (Philemon 1:11–14). Paul did not minimize Onesimus’s sin. This was not some kind of cheap grace that Paul asked Philemon to offer. No, there was sacrifice required in this request, and because of that, Paul approached the topic with gentleness and care (Philemon 1:21). His letter to Philemon presents in full color the beautiful and majestic transition from slavery to kinship that comes as a result of Christian love and forgiveness. "Apphia" (Philemon 2) was no doubt the wife of Philemon; "Archippus" was either his son or the local pastor. There is a planned play on words in Philemon 11, as the name Onesimus means "profitable." The use of the word "forever" in Philemon 15 was a hint of the extension of earthly friendships throughout eternity. This letter is a perfect gem of tact, delicacy, courtesy, and generosity as Paul pleads for Philemon to receive Onesimus "as myself." There is no hint in Scripture as to how Philemon received Onesimus. However, tradition has it that he not only took him back, but, taking Paul's hint, gave Onesimus his freedom. There is a tradition that Onesimus became a bishop in the Greek city of Berea. A writer, some years later, makes mention of one named Onesimus as being bishop there in that very city of Berea. Paul styles himself a "prisoner of Jesus Christ," not a prisoner of the Roman government or of Nero. This is in keeping with his conviction that GOD had placed him in Rome for a special ministry (Philippians 1:12). There is no doubt that Philemon was not only a Christian brother, but a dear, good, generous, benevolent man of GOD. No doubt he was a large source of evangelism and edification in Colosse. The close relationship of all believers in CHRIST is beautifully taught by Paul's new kinship to Onesimus. He is called Paul's "son" (v. 10). Even though as a Christian Onesimus was now truly free, still Paul was careful to send him back directly to his former life. The miracle of salvation is not designed to produce a revolution, but a complete regeneration of the heart. Paul's offer to "repay" what Onesimus had stolen is one of the most touching incidents in the New Testament (v. 18). The fulfillment of Paul's promise to come and visit Philemon (v. 22) is thought to have been accomplished between his first and second Roman imprisonments. KEY: A tender illustration of how the Gospel operates in hearts and results in good deeds. Myer Pearlman - From the glimpse it affords us of the apostle’s courtesy, prudence and skillful address it has been known as the “Polite Epistle.” It does not contain any direct teaching concerning doctrine or Christian conduct. Its chief value lies in the picture it gives us of the practical outworking of Christian doctrine in everyday life, and of the relation of Christianity to social problems. We shall gather our theme from the story told by the Epistle, a story which centers around a runaway slave named Onesimus. The latter was more fortunate than some of his fellow-slaves in that he had for master a Christian, Philemon, a convert of Paul. For reasons not mentioned, Onesimus ran away from his master, and in so doing he probably took with him some of his master’s property. He made his way to Rome, where he was converted under Paul’s preaching. In him the apostle found a sincere convert and a devoted friend. So dear did Onesimus become to him that Paul would have retained him to minister to him in his captivity. But the apostle had to make a sacrifice. Though Onesimus had repented of his sin, there was a call for restitution which could be made only by the slave’s returning and submitting himself to his master. The claim of duty involved a sacrifice not only for Paul, but it demanded a still greater one from Onesimus, who on returning to his master would be liable to severe punishment - crucifixion was a general penalty imposed upon runaway slaves. The sense of right required Paul to return the slave, but the constraint of love caused him to intercede for him and save him from punishment. Taking up his pen he wrote a courteous, tactful letter of eager, affectionate entreaty, identifying himself with Onesimus. After saluting Philemon and his family (Philemon 1-3), Paul commends him for his love, faith and hospitality (Philemon 4-7). The apostle has a request to make. As Paul the apostle, he could command; but as Paul the aged, the prisoner of the Lord, he rather beseeched Philemon (Philemon 8,9). His request is that the latter receive again Onesimus, one who was once unprofitable, but who is now become profitable - Onesimus, Paul’s own son in the faith (Philemon 10-12). So attached had he become to the slave that he would have retained him as servant but without Philemon’s consent he would not act (Philemon 13, 14). Perhaps it was in God’s providence that Onesimus should have departed for a short time, in order that he might return to be forever with his master, not as a servant but as a brother (Philemon 15, 16). Paul identifies himself with Onesimus; if the latter owes anything the apostle will pay it. But Philemon should remember that to Paul he is indebted, in a sense, for his salvation (Philemon 19). That Philemon will obey, and even do more than Paul asks, is the latter’s confidence (Philemon 21). The Epistle concludes with the usual salutations (Philemon 22-25). From Philemon 16 and Philemon 21 we may safely infer that Onesimus was given his freedom. Thus by the regeneration of the individual and by the uniting of master and slave in Christ was the problem of slavery solved - at least in one family. We shall sum up the theme of the Epistle as follows: the power of the gospel in the solution of social problems. 1. Its personal value lies in the insight it gives into the character of Paul, revealing his love, humility, courtesy, unselfishness and tact. 2. Its providential value. We learn here that God may be in the most untoward circumstances (Philemon 15). 3. Its practical value. We are encouraged to seek and redeem the lowest and most degraded. Onesimus had nothing to commend him, for he was a runaway slave, and worse still, a Phrygian slave, from a region noted for the vice and stupidity of its inhabitants. But Paul won him for Christ. 4. Its social value. The Epistle presents the relation of Christianity to slavery. During Paul’s time there were about six million slaves in the Roman empire. Their lot, in general, was miserable. Considered as the property of their master, they were completely at his mercy. They had no rights by law. For the slightest offenses they could be scourged, mutilated, crucified, or thrown to the wild beasts. No permanent marriages were allowed among them, but only temporary unions, which could be broken at the will of the masters. It may be asked, Why did not Christianity attempt to overthrow this system? Because to have done so would have required a tremendous revolution - and the religion of Christ reforms by love and not by force. It teaches principles that undermine and overthrow wrong systems. This method of reformation is well illustrated in the case of Philemon and Onesimus. Master and slave were united in the Spirit of Christ, and in that union all social distinctions were obliterated (Galatians 3:28). Though Paul did not give a direct command to Philemon that he free Onesimus, the words in Philemon 16 and Philemon 21 would imply that such was the apostle’s desire. 5. Its spiritual value. It furnishes us some striking types of our salvation. 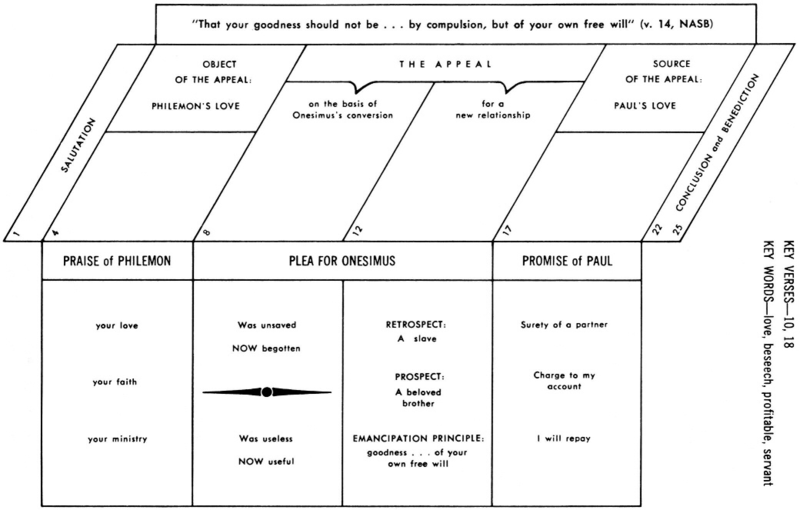 The following incidents will suggest types to the thoughtful student: - Onesimus’ forsaking his master; Paul’s finding of him; - Paul’s interceding for him; - His identifying himself with the slave; - His offering to pay his debt; - Philemon’s receiving Onesimus on Paul’s account; - The slave’s restoration to his master’s favor. Historical and Theological Themes Philemon provides valuable historical insights into the early church’s relationship to the institution of slavery. Slavery was widespread in the Roman Empire (according to some estimates, slaves constituted one third, perhaps more, of the population) and an accepted part of life. In Paul’s day, slavery had virtually eclipsed free labor. Slaves could be doctors, musicians, teachers, artists, librarians, or accountants; in short, almost all jobs could be and were filled by slaves. Slaves were not legally considered persons, but were the tools of their masters. As such, they could be bought, sold, inherited, exchanged, or seized to pay their master’s debt. Their masters had virtually unlimited power to punish them, and sometimes did so severely for the slightest infractions. By the time of the NT, however, slavery was beginning to change. Realizing that contented slaves were more productive, masters tended to treat them more leniently. It was not uncommon for a master to teach a slave his own trade, and some masters and slaves became close friends. While still not recognizing them as persons under the law, the Roman Senate in A.D. 20 granted slaves accused of crimes the right to a trial. It also became more common for slaves to be granted (or to purchase) their freedom. Some slaves enjoyed very favorable and profitable service under their masters and were better off than many freemen because they were assured of care and provision. Many freemen struggled in poverty. Carson, Herbert M., "The Epistle of Paul to the Colossians and Philemon." The Tyndale New Testament Commentaries. Grand Rapids: Wm. B. Eerdmans Pub. Co. (1960). Drysdale, A. H., "The Epistle of St. Paul to Philemon." Devotional Commentaries. London: The Religious Tract Society (1870; 1925 reprint). -- Rich in devotional value, yet a work of scholarly exposition. Full, lucid, and abounding in practical applications. Ernst, Karl J., The Art of Pastoral Counselling. A Study of the Epistle to Philemon. Grand Rapids: Zondervan Publishing House (1941). -- Philemon viewed as a case in pastoral counseling. Interesting and stimulating analysis of the epistle. Gaebelein, Frank E., Philemon the Gospel of Emancipation. Wheaton: Van Kampen Press (1939). -- A brief exposition based on careful study of the text, with applications to daily life. Hendriksen, William, "Exposition of Colossians and Philemon." New Testament Commentary. Grand Rapids: Baker Book House (1964). Hiebert, D. Edmond, "Titus and Philemon." Everyman's Bible Commentary. Chicago: Moody Press (1968). -- An exegetical treatment of both epistles in the light of the original as the basis for an interpretation of the text. Johnson, Philip C., "The Epistles To Titus and Philemon." Shield Bible Study Series. Grand Rapids: Baker Book House (1966). -- A concise, well-outlined interpretation intended as a study guide to these epistles. Kelly, William, An Exposition of the Epistle of Paul to Titus and of that to Philemon, With Translation of an Amended Text. Denver: Wilson Foundation (1968 reprint). -- A careful exposition by a voluminous Plymouth Brethren scholar of the past century. Knox, John, and Buttrick, George A., "The Epistle to Philemon," The Interpreter's Bible. Vol. XI. New York: Abingdon Press (1955). -- Introduction and exegesis by Knox; exposition by Buttrick. -- Knox propounds the novel view that the real owner of Onesimus was Archippus and that the purpose of the letter was to secure the return of Onesimus to Paul for his own service. Lenski, R. C. H., The Interpretation of St. Paul's Epistles to the Colossians, to the Thessalonians, to Timothy, to Titus and to Philemon. Columbus, Ohio: Lutheran Book Concern (1937). Lightfoot, J. B., Saint Paul's Epistle to the Colossians and to Philemon. London: Macmillan and Co. (1927 reprint). Lohse, Eduard, "Colossians and Philemon, A Commentary on the Epistles to the Colossians and to Philemon." Hermenia—A Critical and Historical Commentary on the Bible. Translated by William R. Poehlmann and Robert J. Karris. Edited by Helmut Koester. Philadelphia: Fortress Press (1971). Maclaren, Alexander, "The Epistles of St. Paul to the Colossians and to Philemon," The Expositor's Bible. Grand Rapids: Wm. B. Eerdmans Pub. Co. (1943 reprint). Martin, Ralph P., "Colossians and Philemon." New Century Bible Based on the Revised Standard Version. London: Oliphants (1974). Müller, Jac. J., "The Epistles of Paul to the Philippians and to Philemon." The New International Commentary on the New Testament. Grand Rapids: Wm. B. Eerdmans Pub. Co. (1955). -- A concise interpretation by a conservative professor of South Africa. Seeks to maintain a balance between exact scholarship and the practical import of the letters. Technical matters are confined to the footnotes. Moule, C. F. D., "The Epistles of Paul the Apostle to the Colossians and to Philemon." Cambridge Greek Testament Commentary. Cambridge: University Press (1957). Moule, H. C. G., "The Epistle of Paul the Apostle to the Colossians and to Philemon." Cambridge Bible for Schools and Colleges. Cambridge: University Press (1893; 1932 reprint). Radford, Lewis B., "The Epistle to the Colossians and the Epistle to Philemon." Westminster Commentaries. London: Methuen & Co. (1931). Scroggie, W. Graham, A Note to a Friend, Paul to Philemon. London: The Hulbert Publishing Co. (n.d.). -- An in-depth study of this brief letter, based upon a detailed outline, with warm practical lessons. Richly rewarding. Thomas, W. H. Griffith, Studies in Colossians and Philemon. Edited by Winifred G. T. Gillespie, his daughter. Grand Rapids: Baker Book House (1973). From Hiebert's highly recommended resource: An Introduction to the New Testament. Introduction to Philemon - similar to following but Greek words are translated into English in this version. A. Lukyn Williams (1853–1943) was ordained to the priesthood in 1877, and became principal of Moore Theological College in 1878. On Philemon, Williams also discusses its canonicity, as well as its relation to slavery. H. C. G. Moule (1841–1920) was the son of the vicar of Fordington, Dorchester, and was educated at home prior to attending university at Cambridge. He was ordained in 1867 and was curate at Fordington before being appointed as dean of Trinity College, Cambridge, 1873 to 1876. During his tenure at Cambridge he became first principal of Ridley Hall Theological College, in 1881, and Norrisian Professor of Divinity in 1899. In 1901, he succeeded B.F. Westcott as Bishop of Durham. He wrote Colossians and Philemon in a single volume - This volume is divided into two distinct sections, covering first Colossians and then Philemon. Before the verse-by-verse commentary on each epistle, facts and background information are laid out in a detailed manner. Included is an essay entitled "Slavery, and the Attitude of Christianity Towards It." Philemon Commentary - 24 pages - has critiques of other resources on Philemon. A Friend – Philemon 1:17-25 - Listen to this one if you (or someone you know) is having difficult with forgiveness! D Edmond Hiebert - Rich in devotional value, yet a work of scholarly exposition. Full, lucid, and abounding in practical applications. Note that this commentary is on site. Hiebert - A careful exposition by a voluminous Plymouth Brethren scholar of the past century. This series by MacArthur in 1991 is entitled "Forgiveness: How to Restore Broken Relationships" - It’s the simple mathematics of being human. Two people plus one relationship equals inevitable pain. One unkind word, careless act, or intentional attack, and a gulf is opened that could potentially damage a relationship forever. That’s where the need for real, biblical forgiveness comes in. Forgiveness can heal even the worst damage between husbands and wives, children and parents, longtime friends, and everyone in between. In Forgiveness, John MacArthur looks to the life of Philemon to illuminate one of Scripture’s greatest examples of human forgiveness in action. Philemon 6 - That the fellowship of thy faith may become effectual. That was the burden of Paul's prayer for Philemon; and in sending Onesimus back to him, he was creating a new opportunity for his realization of that very thing. Philemon had faith, as Paul had already said; and it was a double faith, "toward the Lord Jesus, and toward air the saints." That faith necessarily placed him in the realm of fellowship, and that was also two-sided: fellowship with the Lord Jesus, and fellowship with all the saints. Such was his faith, his conviction, that to which he had yielded himself. Such was his fellowship, his vital relationship, the good thing which was in him. Paul's prayer for him was that it might be effec­tual; that is, effective. Faith and fellowship are at once made valuable and vindicated as they are active. While a number of names are found in this letter, three stand out prominently, those of Paul, Philemon, and Onesimus. They share a common faith; they are members of one fellowship. The circumstances were such as to give the fellowship of their faith an oppor­tunity for action; that is, to become effectual. It was so in the case of Paul, as he sent Onesimus back to his master, even though he would have been serviceable to himself in his prison. It was so in the case of Onesimus, in that he went back to the master whom he had wronged in running away from him. The letter was written that it might be so in the case of Philemon as he received Onesimus, "no longer as a servant … but a brother beloved." Philemon 1:1 - click Philemon 1:2 in upper right corner to go to next verse. The letter to Philemon is also addressed to Apphia and Archippus (v. 2). That Philemon is the intended primary recipient, however, is clear from the fact that, apart from the conclusion of the letter (vv. 22,25), which uses the second-person plural pronoun (referring to all three addressees), the rest of the letter employs the second-person singular pronoun (Gk. su [ σύ ] ) in addressing the primary recipient, who is surely Philemon. Paul's reference to the "church in your (sing.) home" (v. 2) clearly indicates that a single household is intended. Therefore, these three individuals were probably related. Perhaps Apphia was the wife of Philemon and Archippus was his son. The letter of Philemon is little more than a note in length, consisting of only 335 words in Greek, and hardly more than a memo in nature. Although the letter contains no theological arguments, it is written from a definite theological presupposition centering on Onesimus's new postconversion relationship (v. 10) in the flesh and in the Lord (v. 16). The theological premise is that upon conversion even a slave becomes an equally important part of the body of Christ, the Christian family; the premise is that, in Christ, there is no longer slave nor free (cf. Galatians 3:28 ). Paul had earlier written to the Corinthian believers that whoever was called in the Lord as a slave is a freed person belonging to the Lord, just as whoever was free when called is a slave of Christ (1 Corinthians 7:22 ). In Philemon, as in the beginning of every letter in the Pauline corpus except Titus, the readers are reminded that every Christian is a slave of the Lord Jesus Christ. Excerpt: The usual penalty for an escaped slave was death or branding with a hot iron to mark him with the letter “F” forfugitivus, a fugitive. Paul is not expecting Philemon to do any of this.....What happened to Onesimus? Church history records that Onesimus was set free as a slave by his master Philemon (Apostolical Canons ). The Apostolical Constitutions [7.46] state that he was consecrated by Paul to be bishop of Berea, in Macedonia, and that he was martyred at Rome. "What are the prison epistles?" Philemon 1:16 - Doesn’t Paul approve of the institution of slavery? Philemon 1:15KJV - "For a Season...Forever"
Philemon 1:1 - Whose Prisoner Are You? Philemon 1:4-7 - Pure Water - The legend is told of a desert wanderer who found a crystal spring of unsurpassed freshness. The water was so pure he decided to bring some to his king. Barely satisfying his own thirst, he filled a leather bottle with the clear liquid and carried it many days beneath the desert sun before he reached the palace. When he finally laid his offering at the feet of his sovereign, the water had become stale and rank due to the old container in which it had been stored. But the king would not let his faithful subject even imagine that it was unfit for use. He tasted it with expressions of gratitude and delight, and sent away the loyal heart filled with gladness. After he had gone, others sampled it and expressed their surprise that the king had even pretended to enjoy it. "Ah!" said he, "it was not the water he tasted, but the love that prompted the offering." Many times our service is marked by multiplied imperfections, but the Master looks at our motives and says "It is good." Philemon 1:4-7 - Remembering to Thank People - One day in the early thirties, William Stidger and a fellow pastor sat in a restaurant talking about the worldwide depression—the suffering people, rich committing suicide, the jobless. The pastor said, "In two or three weeks I have to preach on Thanksgiving Day. What can I say?" Stidger said it was like the Spirit of God answered that question: "Why not thank those people who've been a blessing in your life and affirm them during this terrible time?" He thought of an English teacher who had instilled in him a love of literature and verse, affecting all his writing and preaching. So he wrote to her. In a matter of days he got a reply in the feeble scrawl of the aged. "My Dear Willy: I can't tell you how much your note meant to me. I am in my eighties, living alone in a small room, cooking my own meals, lonely, and like the last leaf of autumn lingering behind. You'll be interested to know that I taught in school for more than 50 years, and yours is the first note of appreciation I ever received. It came on a blue, cold morning, and it cheered me as nothing has done in many years." "A NOTE TO A FRIEND"
Comment: This excellent commentary is filled with "pearls," is a very easy to understand and is imminently applicable to real life. Scroggie writes 171 pages on ONE CHAPTER and discusses not just each verse but even each phrase. Excellent exposition! D Edmond Hiebert an excellent expositor in his own right writes - "An in-depth study of this brief letter, based upon a detailed outline, with warm practical lessons. Richly rewarding." A Note to a Friend - When a Field-Marshal, such as Paul was, speaks of a "private," such as Archippus was, as a "fellow-soldier," he may reckon on that Tommy to follow him in the fight to the death. When a master-workman, such as Paul was, speaks of an obscure person like Philemon as his "fellow-worker," he has made him capable of better work than ever before. It is this "milk of human kindness" that feeds our hearts; it is generous acknowledgment and praise, such as Paul bestoweed, that tone up life and service, and make men and women capable of untthought-of deeds. Let us from this simple yet profound introduction learn what Christianity is at its best. This is the briefest of all Paul's Epistles. It is the only sample of the Apostle's private correspondence that has been preserved. It is known as "The Courteous Epistle." Its object was to persuade Philemon not to punish, but reinstate, his runaway slave, called Onesimus, and as he was now converted, treat him as a brother in the Lord. THE TASK AND ITS ACCOMPLISHMENT. Invariably, in those days, runaway slaves were crucified. Paul must try to conciliate the master— Philemon—without humiliating the servant—Onesimus; to commend the repentant wrong-doer, without extenuating his offence; thus he must balance the claims of justice and mercy. 1. Touching Philemon's heart by several times mentioning that he was a prisoner for the Gospel's sake. 2. Frankly and fully recognized Philemon's most excellent Christian character, thus making it difficult for him to refuse to live up to his reputation, and to lead him to deal graciously with the defaulter. 3. Delayed mentioning the name of the penitent until he had paved the way. 4. Referred to Onesimus as his "son," thus establishing the new kinship in Christ. 5. After presenting his request, assumed Philemon would do as he had requested (Philemon 1:21). 6. Refused to command with the authority of an apostle, but entreated as a brother, as a bosom friend. See verses 8, 9, 20; especially "Dearly beloved" (Philemon 1:1). 7. Frankly acknowledged the wrong done (11), and promised to make good any loss (Philemon 1:18, 19). 8. By a careful choice of words, avoided irritation, as, for example, he says "departed" (Philemon 1:15), not fled or runaway, etc., etc. 9. Feels the slave must not encounter his outraged master alone, so arranges for Philemon's friend, Tychicus, to accompany him and act as mediator. It is clear that Tychicus conveyed this letter to Philemon with Onesimus. (See Colossians 4:7-9). 10. Mentions his plans to visit Philemon (22); and how could he meet him if he had refused to carry out his request? I. Fellow-believer. Trusting (Philemon 1:6). 1. "Fellowship of your faith" is R.V. "This faith which you share with us" (Way.). 2. What a glorious fellowship is this of faith. What an honor to be numbered as a member of the Lord's Household of Faith. 1. Apphia is called "The Sister" in R.V. Was she Philemon's wife or daughter? 2. It is generally understood that Archippus was Philemon's son. 3. Fighting follows trusting. Soon the young believer discovers this. Fightings without—yes, and fightings within—"Flesh lusts against the Spirit, and the Spirit against the flesh" (Galatians 5:17). Remember it was immediately after God had given water (type of Holy Spirit) to Israel, that Amalek (type of flesh) fought Israel. (See. Exod. 17:1-8). Observe force of "Then" in verse 8. But in this fight, through our Heavenly Moses on the Mount—our Lord Jesus as Great High Priest—we are more than conquerors. 1. Philemon is not mentioned in the Epistle to the Colossians, but Archippus, whom Paul associates (in Philemon 2) with Philemon, is mentioned in such a way as to imply that both were office-bearers (Colossians 4:17). "Sharer in our toil" is Way's translation. Philemon was one of Paul's converts. IV. Fellow-prisoner. Suffering (Philemon 1:23). 1. Only Epistle where Paul begins by simply calling himself a "prisoner." Six times does he allude to this (Philemon 1:1,9,10,13,22,23). 2. The Epistle begins with Paul in bonds, but leads up to Paul in prayer. 3. Observe, "prisoner for Jesus Christ" (1, R.V.). He does not dwell on this in any spirit of boasting or proud display, but for a benign purpose. 4. Suffering for the Lord falls naturally to the lot of all born-again ones. The lustings of the flesh, for example, cause suffering. Then grace does refine, making us more sensitive to the jeers and taunts of the world, and to the unkind and uncharitable criticisms of fellow-believers. 5. But let us never forget we are not the only sufferers, for this is the common lot of all believers. "Fellow-prisoner." 6. It is generally understood that the prominent brethren took turns in voluntarily sharing the Apostle's imprisonment, so as to minister to him in his bonds, "not being ashamed of his chain" (2 Timothy 1:16). By such a fellowship of suffering they must have refreshed the heart of the Apostle. 7. Epaphras is the shortened or provincial form of Epaphroditus. AN ANALOGY OF OUR SALVATION. I. Original Position. God created man perfect, and thus man was His property. But in sinning he not only departed from God, as Onesimus had done, but also robbed Him of His rights and just dues. II. Sad Plight. As Onesimus fled to Rome, and was in a parlous position, so with man. As Roman law gave a slave no right to asylum, so the Law of God affords man no right of asylum, no resting place, no way of escape. The Law says, "The soul that sins, it shall die." III. God has a Partner (Philemon 1:17). It is thought by some that Philemon and the Apostle had been partners in some business concern. In Jesus, God has a Partner utterly and entirely one with Him. He interposes on our behalf. Knowing to the full how much we have wronged God, and how much we owe Him, Jesus says, "Put that on Mine account." All our debt is put to Christ's account. IV. Grace Intervenes. Roman law permitted a slave to flee to his master's friend, who could plead for him. Onesimus sought out his master's friend, Paul the Apostle, and he was born again—"whom I have begotten in my bonds" (10). Sinners fly to the Lord Jesus Christ. In Him, and through Him, they receive pardon, are begotten anew as sons, and find both a Savior, an Intercessor, and a Father. The sinner returns to God, and is received, not as a runaway slave, but as Christ Himself (Philemon 1:16). I. The Object of the faith and love of His people (5). "A faith that looks up to our Lord Jesus" (Way). II. The Channel through which God's grace and peace becomes ours (Philemon 1:3, 25). III. The Source of any good thing in us (Philemon 1:6). IV. The Transforming Power (Philemon 1:16). In Philemon 1:11 we have two pictures of one man. Here is a play upon the meaning of the name of Onesimus, which is "Profitable." Profitable by name, he became, through sin, unprofitable to his Master, but through the grace of the Lord, and through Christ's wonderful transforming power, profitable to both Paul and his friend Philemon. The Lord transforms waste into wealth. "In the Lord" (Philemon 1:16), that is the explanation of the wonderful transformation in Onesimus. V. Gives Boldness to His servants (Philemon 1:8). VI. Gives Satisfaction and refreshment to workers, by prompting their converts to generous and praiseworthy actions (Philemon 1:20). VII. Gives Restfulness in the consciousness that He knows all, and that nothing can come to us save by God's permission (Philemon 1:1, 9, 23). Observe, Paul calls himself, not a prisoner of the Roman authorities, true though that was, but of Jesus Christ. Behind Rome he saw the Lord, and knew his imprisonment could not have been but for Divine permission. This may be taken as the key-word of the Epistle, and forms both its heart and radiating center. Observe the gathering emphasis in his repetition of this word, how he strikes each time a louder note and a higher key. I. The Act. What was he to do? Receive (Philemon 1:12). II. The Manner.—How was he to receive Onesimus? 1. As Philemon would Receive Paul Himself (Philemon 1:12, 17). "As my own flesh and blood" (C. & H.). "As a piece of my very heart" (Way). "I send part of myself" (W.). As Dr. Scofield has pointed out,. "Receive him as myself"—reckon to him my merit. "If he has wronged you or owes you ought, put that to my account" —reckon to me his demerit. Striking illustration of the Divine reckoning in our justification. 2. As a Beloved Brother in the Lord (16). In the flesh, Philemon has his brother-man for his slave; in the Lord Jesus he has the slave for his brother. By conversion, one sinner becomes son to Paul and brother to Philemon, his owner and master. III. The Period. "Receive him forever" (Philemon 1:15). "For perhaps he therefore departed for an hour (lit. ), that you should receive him forever." What a contrast we have here. Paul suggests a loving Providence over-ruling. Note the intensity of feeling apparent by Paul's use and repetition of the strong word "beseech." But pray also note the Apostle's great wisdom in waiving his authority to command. 1st. He was an Apostle. 2nd. He was Philemon's spiritual father. 3rd. Philemon was an office-bearer under Paul. II. Paul's Wisdom (Philemon 1:9). Paul wisely decided, in this case, not to exercise his authority, but to appeal to their mutual love, and to his aged and suffering condition. Elder brethren, and Christian leaders in Churches, would be well advised to more frequently emulate Paul's example, and to take care that their responsible position does not create a permanent, officious, domineering, autocratic, and dictatorial spirit. Such can easily be developed. Note the frequency in Paul's Pastoral Epistles of his commendation of a "gentle" spirit. There is a world of wisdom in that exhortation. III. Paul's Success (Philemon 1:10). There is no doubt whatever that Paul succeeded in his plea. His skill in presenting his case, and, above all, his gentle, loving entreaties were overwhelming. More success would be granted in many difficult Assembly and Church matters if Paul's example were more frequently copied. THIS has been called “the polite epistle,” for Paul used great courtesy and tact in writing it. Onesimus, a slave, had robbed his master Philemon, and had then run away from him. Hoping to conceal himself best in the metropolis, Onesimus had fled to Rome, where he heard Paul preach and became converted. The apostle sent him back to his Christian master with the following letter of apology. Although its first object was only to restore a runaway slave to his master, it is a weighty letter, and every syllable has substance in it. He joins Timothy with himself, to give double weight to the message. Probably Timothy was well known to Philemon, and much respected by him, so he puts Timothy’s name that there might be two to plead with him. Then, notice the loving titles with which Paul addresses Philemon: “our dearly beloved, and fellow laborer.” Probably the person whom Paul called “beloved Apphia” was Philemon’s wife, so he writes to help also for perhaps the wife was the more tender-hearted of the two, so she might put in a good word for Onesimus, and her husband would all the more readily grant Paul’s request. He also mentions Archippus, who was either the pastor of the church at Colosse, or an evangelist who stayed occasionally at the house of Philemon. So he mentions him with all the rest of the household who met there for worship, and so made up the church in the house. Is there a Church in this house? Are parents, children, friends, servants, all members of it? or are some still unconverted? Let us pause here and let the question go round—Am I a member of the Church in this house? How would father’s heart leap for joy, and mother’s eyes fill with holy tears if from the eldest to the youngest all were saved! Let us pray for this great mercy until the Lord shall grant it to us. Probably it had been the dearest object of Philemon’s desires to have all his household saved; but it was not at first granted him in its fulness. He had a wicked servant, Onesimus, who, having wronged him, ran away from his service. His master’s prayers followed him, and at last, as God would have it, Onesimus was led to hear Paul preach; his heart was touched, and he returned to Philemon, not only to be a faithful servant, but a brother beloved, adding another member to the Church in Philemon’s house. Is there an unconverted servant or child absent this morning? Make special supplication that such may, on their return to their home, gladden all hearts with good news of what grace has done! Is there one present? Let him partake in the same earnest entreaty. If there be such a Church in our house, let us order it well, and let all act as in the sight of God. Let us move in the common affairs of life with studied holiness, diligence, kindness, and integrity. More is expected of a Church than of an ordinary household; family worship must, in such a case, be more devout and hearty; internal love must be more warm and unbroken, and external conduct must be more sanctified and Christlike. We need not fear that the smallness of our number will put us out of the list of Churches, for the Holy Spirit has here enrolled a family-church in the inspired book of remembrance. As a Church let us now draw nigh to the great head of the one Church universal, and let us beseech him to give us grace to shine before men to the glory of his name. Paul recalls how much Philemon had done in the comforting of persecuted and poor saints. And when you are about to ask a favor of anyone, it is well to show your gratitude for what you or others have already received from him. Paul knew Philemon was a true believer, and therefore prayed that others might feel the power of his piety, by seeing how he acted in the present case. This is the best of pleading. Philemon’s heart would be sure to yield to it. "Mine own bowels" (my very heart,) - who is so dear to me that he carries my heart with him wherever he goes. Though he felt sure that Philemon would have been glad to spare his servant to care for his aged friend, yet Paul would not take the liberty of using his services, but gave Philemon the opportunity to do it of his own accord if he thought fit. Providence suffered him to run away that he might come under Paul’s influence and become a Christian: the gracious purpose of God overrules evil for good. How beautifully this is put all through! It very much reminds me of our Lord Jesus Christ, who seems to say to the Divine Father, “This poor child is in fellowship with me. Receive him, therefore, as myself;” and this is just what God does in the case of repenting and believing sinners; he receives them just as if he could see Christ in them. How generously this is put by this poor prisoner at Rome, and how gloriously, in this, he is like our Master, who stands as Surety for us! Paul had been the means of Philemon’s conversion, so he was immeasurably in debt to the apostle; but Paul only gently reminds him of the fact as a reason why he should deal kindly with Onesimus for his sake. This is delicately yet forcibly put, and we feel certain that Philemon must have done as Paul wished, even though we have no record of the fact. Is not this a graceful way of putting it? Who could have the heart to resist such pleading? Yet every word is gentle and quiet. Mild language is mighty. O’er earth may thy kingdom establish its claim! And thine be the glory for ever. Amen. Conservative, well-done. Transcripts 5-7 pages each. D Edmond Hiebert on his commentary - Greek text. A scholarly, generally conservative interpretation with valuable introductions and word studies and exegetical comments.